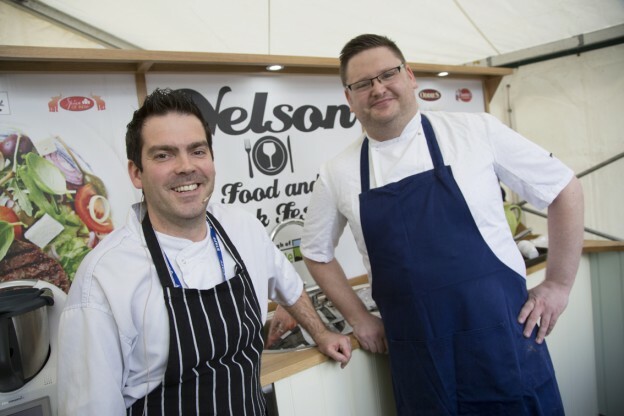 A sunny September day saw Nelson Food and Drink Festival thronged with thousands of visitors flocking to the town centre on Saturday. 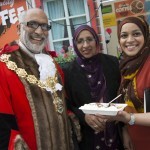 They were rewarded with a full day of foodie fun and the chance to sample a wide range of delicious treats at the fabulous free festival with a real multicultural flavour. Mayor of Pendle Coun. Nawaz Ahmed, who officially opened the festival at 10am, stayed for the rest of the day, mingling with the crowds, enjoying the entertainment and talking to the stallholders in the Worldwide Food Market. “I believe there were easily eight to nine thousand people here in Nelson today,” said a delighted Coun. Ahmed. Centred on The Shuttle monument, the event began with Nelson town crier Tony Edwards welcoming everyone before handing over to the Mayor to officially open the festival with a ribbon cutting. With more than 20 stalls selling everything from sausages to samosas and cupcakes to charcoal grilled chicken, the Worldwide Food Market was busy from the off, with stallholders reporting an excellent day’s trading and still busy as the festival drew to a close at 4pm. 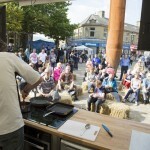 Highlights of the day were live cookery demonstrations in the outdoor cookery theatre set up next to The Shuttle and filling its surrounding amphitheatre with people keen to pick up culinary tips from the experts. 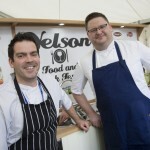 Central to these was entertaining celebrity chef Richard Fox, whose easygoing, down to earth and amiable style was a real hit with the Nelson crowds. He performed three of the demonstrations himself and hosted two others given by local restaurant Spice of India and the festivals’ main sponsor, Nelson and Colne College. Its lecturer Mark Taft was joined by John Jones from the award-winning Seafood Pub Company and together they rustled up a full three-course gourmet menu in a fascinating and fast-paced presentation. After each session the spectators were invited to sample the delicious dishes which had just been created. Richard Fox is also a great campaigner against food waste and was delighted to welcome Pendle’s own chef, writer and ‘food activist’ Gill Watson, who talked about her culinary career and her work locally to cut food waste and help people eat well whatever their budget. 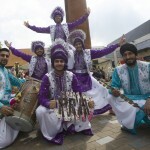 A visual highlight was a colourful and energetic half-hour performance by the Punjabi Roots Dance Academy, whose programme fused traditional Indian dancing and music with modern pop rhythms and had a large crowd of spectators roaring its approval. Free face painting and henna art were on offer in Nelson marketplace, with the colourful results evident all around the festival. Upstairs in the Pendle Rise shopping centre a ‘Cakelicious’ children’s cake decorating competition was kept busy all day. 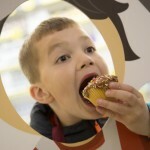 It was sponsored by another of the festival’s key supporters, Oddies family bakers, which supplied all the plain cupcakes and decorating materials, with students from Nelson and Colne College on hand to help. Scores of visitors also arrived at the festival in style aboard a classic 1968 Leyland Titan double- decker bus. Supplied by Darwen Transport Trust, it ferried passengers for free, running on two routed from Burnley and Barnoldswick for most of the day. 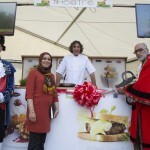 As the festival drew to a close, chef Richard Fox commented: “What a great day! I’ve had a really friendly welcome from the people of Nelson and Pendle and what wonderful food we’ve seen cooked and on sale here today. 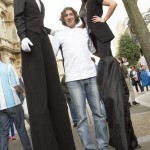 This entry was posted in event management, events, food festival, Pendle Council on September 22, 2015 by admin.